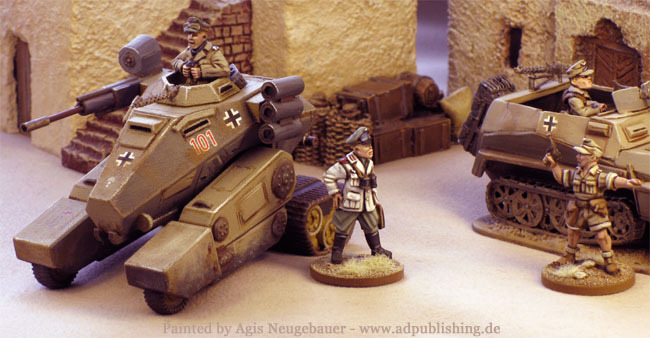 GnG by Company B - Gear Krieg goes 28mm! Gears and Guts is a joined venture of Brent Dietrich of Company B and John Cunningham. 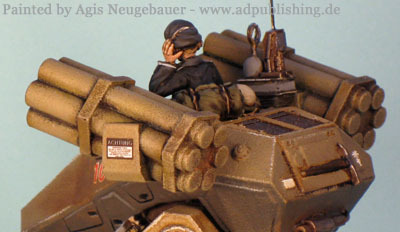 They have acquired a license from DP9 to produce 1/56 models of the classic 15mm Gear Krieg models by DP9. 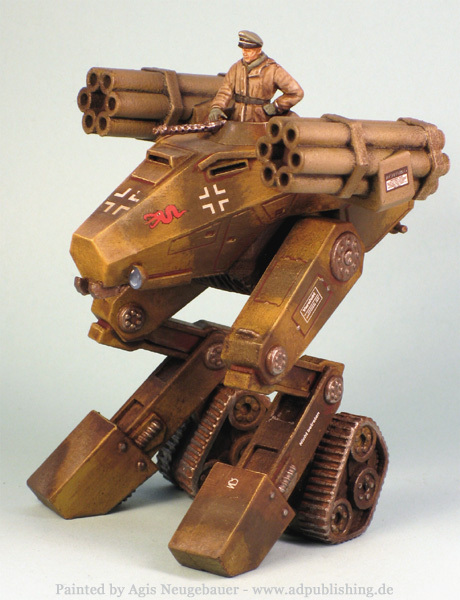 Very much in the way I have the license to produce World at War books based on the original Gear Krieg books. Brent and John approached me a couple of months ago for additional input on the project. Very soon after that we received even more in depth support by John Bell (aka Jakar Nilson) the guy behind the great GK “Alfies Tenners” comics. Soon ideas were flying around via the interweb and the first walkers were taken shape. 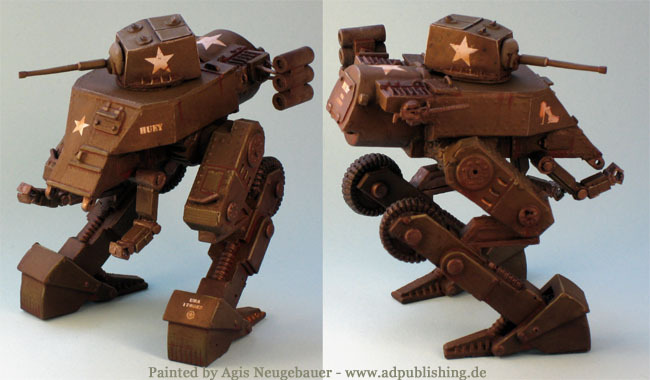 We agreed that I would paint the walkers. The General Early walkers shown are a pre-production prototypes with some weapons still missing. 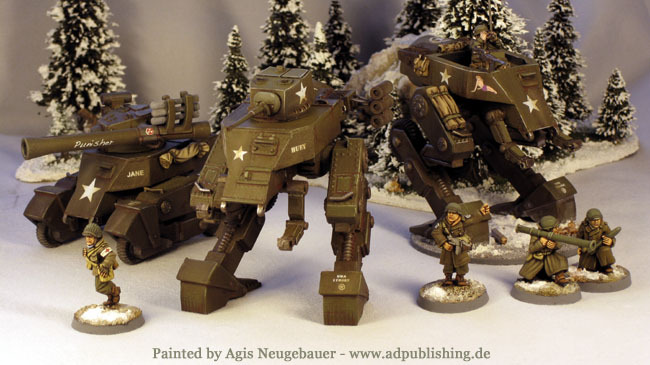 The Artizan Greatcoat troopers (painted by Tom Weiss) are shown for scale comparison. The final models will have even more details and a full complimenting set of decals included. Jakar is even working on vehicle dashboard layouts! 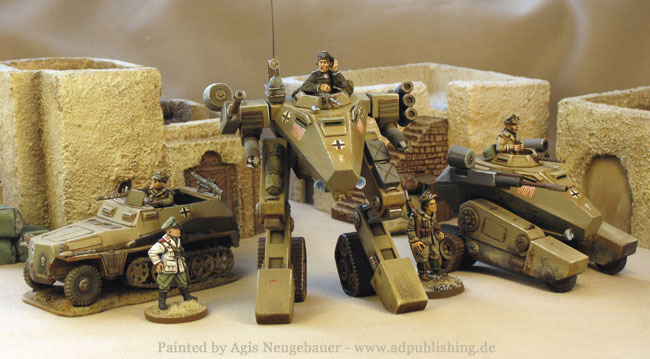 Walküre Ausf E production model with Company B decals and Artizan infantry minis. The production models are a big improvement over the pre-production prototypes, you can clearly see the amount of work that was put into finishing these beauties. You are getting a detailed exhaust in metal. The decals have German texts that actually make sense! 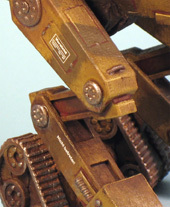 The design team even took pains to create a reasonable little walker tactical symbol (shown on the left “foot” of the walker). The hull has a hole to give you the option to use magnets for mounting the different weapons or manipulator arms! 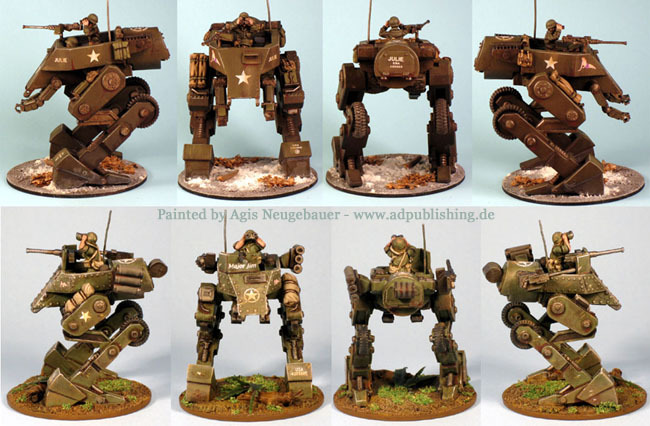 General Early Combat Walker (2 prototype models and the final kit in the middle). 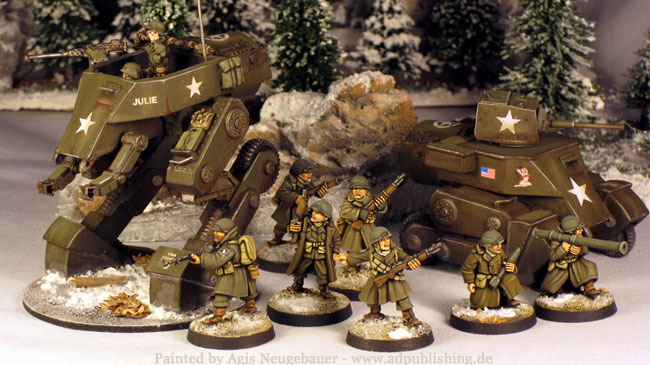 The above picture shows how well the spirit of the 15mm models is captured! Release dates and future plans are noted on Brents website under the Gears and Guts subsection. 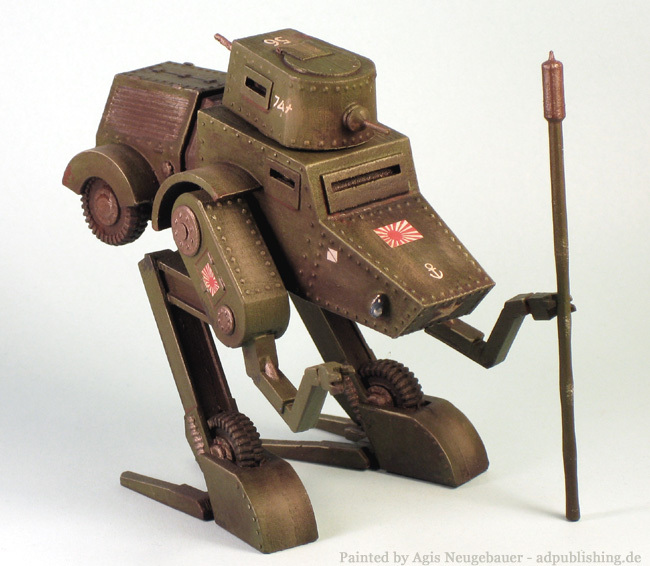 M11A3 General Early Combat Walker Final model kit in walker mode. 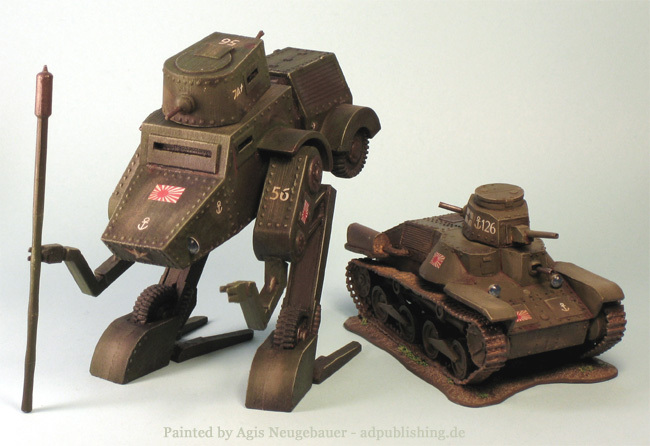 M11A3 General Early Combat Walker Final model kit in vehicle mode. 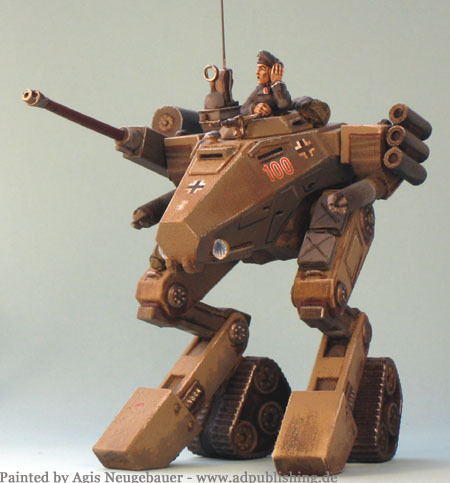 M11A3E2 General Early Combat Walker prototype model kit in vehicle mode. 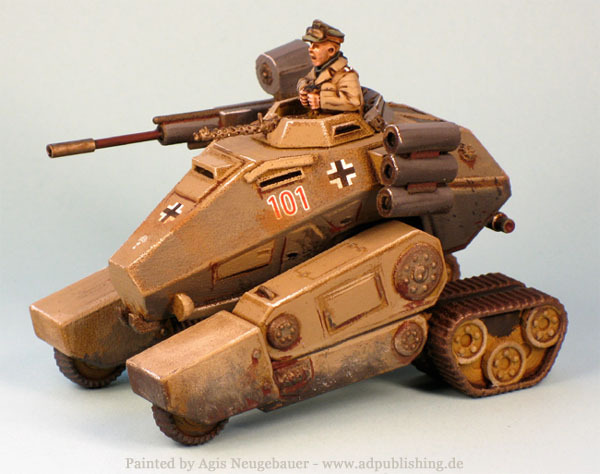 Sands Models Sherman together with a General Early in vehicle mode. 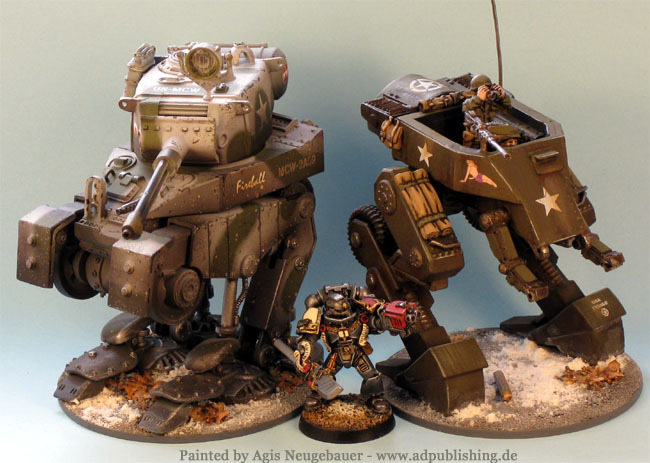 SDUST walker, GW Grey Knight together with a General Early in walker mode. Walküre Ausführung B in tracked mode. Crewman by Artizan. Walküre Ausführung C in walker mode. 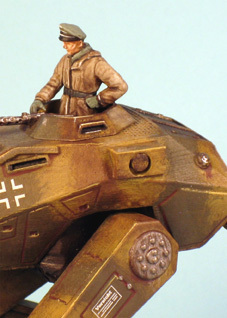 Crewman by Bolt Action. Walküre Ausführung C in walker mode. Walküre Ausführung B in tracked mode. Weird War has come a long way. 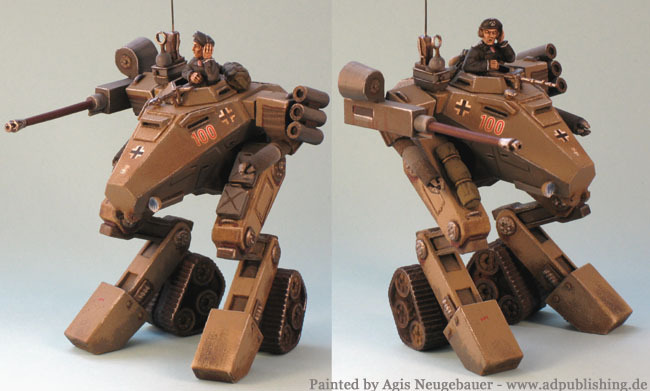 The model to the right is my scratch build walker that was my clumsy take an building a Gear Krieg walker. 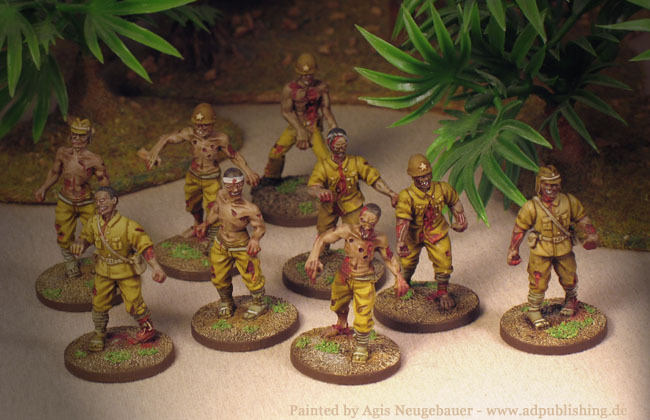 GnG by Company B gets even better - 28mm Japanese Zombies! 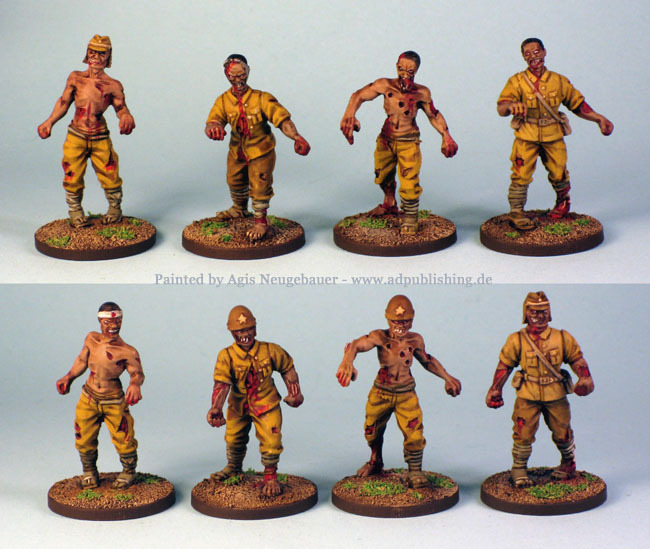 To support the GnG line in 28mm Brent Dietrich of Company B and Brother Vinni joined forces to produce 28mm Japanese Zombies. They consist of 4 unique sculpts. In addition you can get 5 different heads for some easy conversions (as shown below). 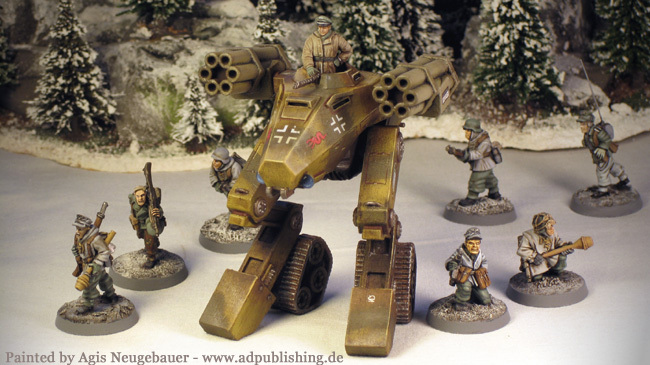 These guys just fit perfectly in to represent 28mm Gear Krieg Koumajutsu. Another pic of the Japanese Zombies, this time a full 10 Zombie group. The 2 left Zombies in the second row are from the Incursion range. 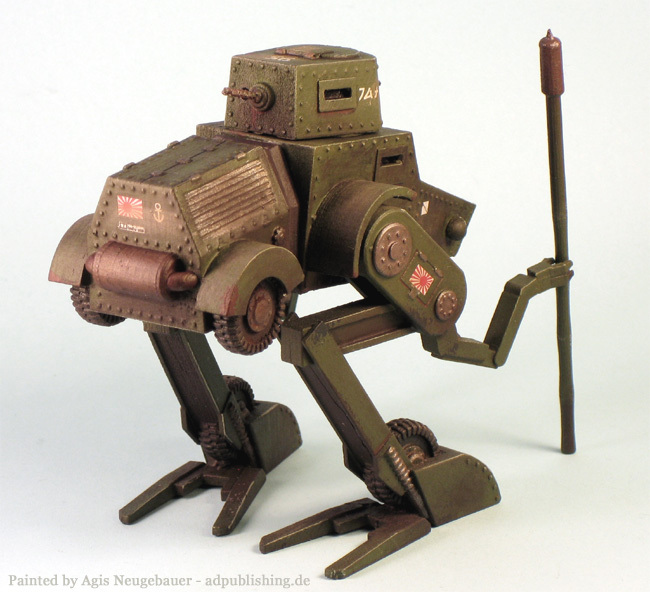 To support the GnG line in 28mm Brent Dietrich of Company B finally released the Japanese Shiki walkers! The Shiki 38 - a basic variant with one turret mounted MG and one rear turret mounted MG, one Teppoyari and Anti-Tank Explosives. 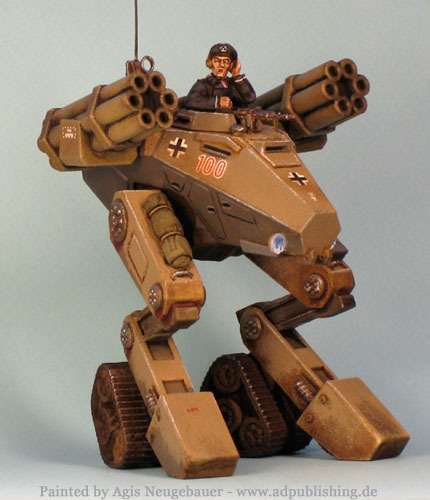 The kit comes with both leg variants, walking and ground mode! 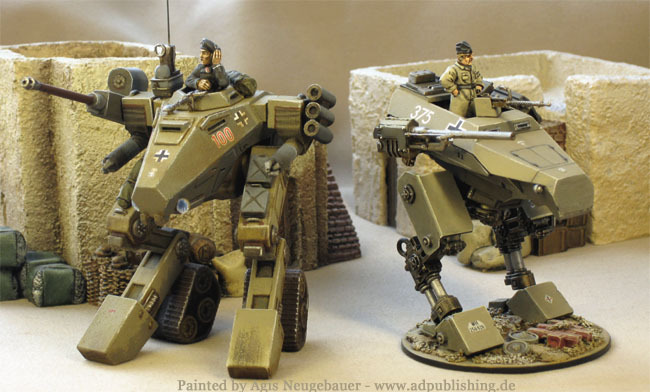 Rules to use these walkers in your Victory Decision games can be found in the ViDe: Gear Krieg book.